Income shocks are pervasive, with 96 percent of Americans experiencing at least four in their working years. For example, a drop of 10 percent or more four times in your life can reduce retirement savings by $25,000 on average. This average is higher for low-income Americans, whereas wealthier Americans have healthy emergency funds to draw from. I would like to challenge the notion that the retirement crisis is due to poor savings habits. Less privileged Americans have few options when unexpected hardship hits before retirement. 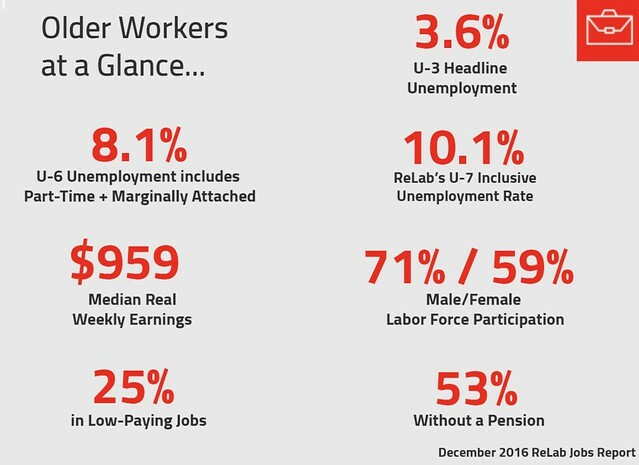 The Bureau of Labor Statistics (BLS) today reported a 3.5% unemployment rate for workers ages 55 and older in January, a decrease of 0.1 percentage points from December. 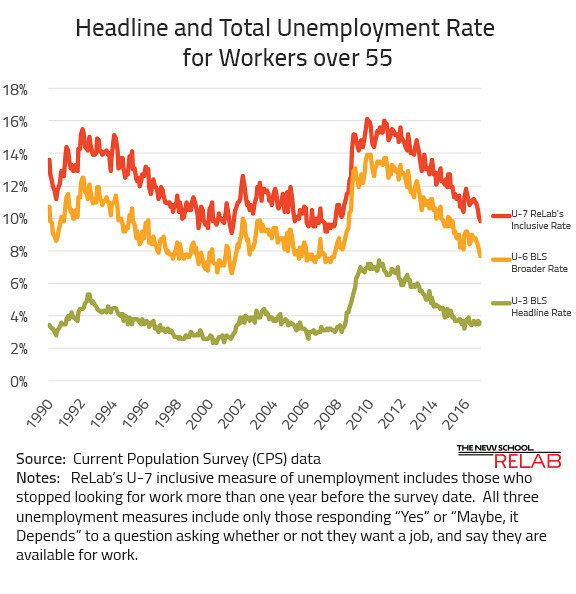 The low headline unemployment rate hides a racial gap in the physical job demands faced by older workers. 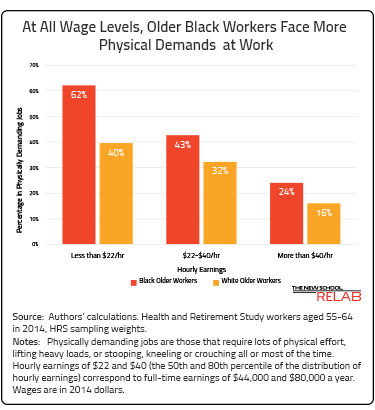 At all income levels, older black workers are more likely to experience physical demands at work than older white workers, including requirements to lift heavy loads, stoop, kneel or crouch during most of the workday. The racial gap, which exists at all wage levels, is largest among older low wage workers. The gap among those earning less than $22 an hour is 22 percentage points, with 62% of Blacks in physically demanding jobs compared to 40% of Whites. For workers earning between $22 and $40 an hour, the gap is 11 percentage points, with 43% of Blacks are in physically demanding jobs compared to 32% of Whites. The racial gap persists even for higher earners. 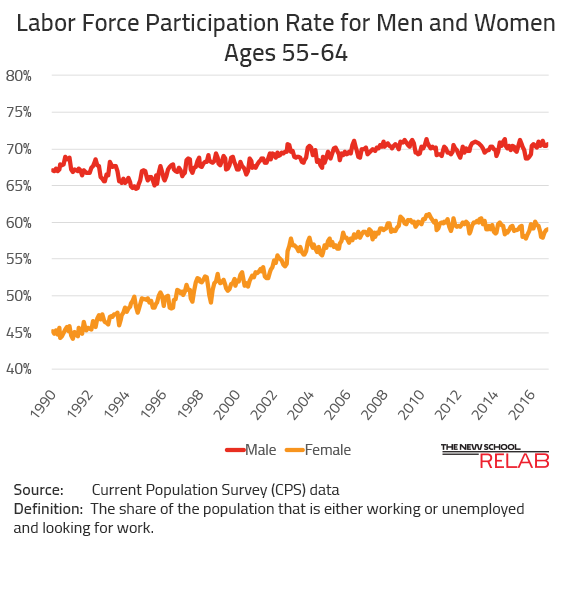 For those in the top 20% of the earnings distribution making more than $40 an hour, the gap is 8 percentage points, with 24% of older Blacks are in physically demanding jobs, compared to 16% of older Whites. 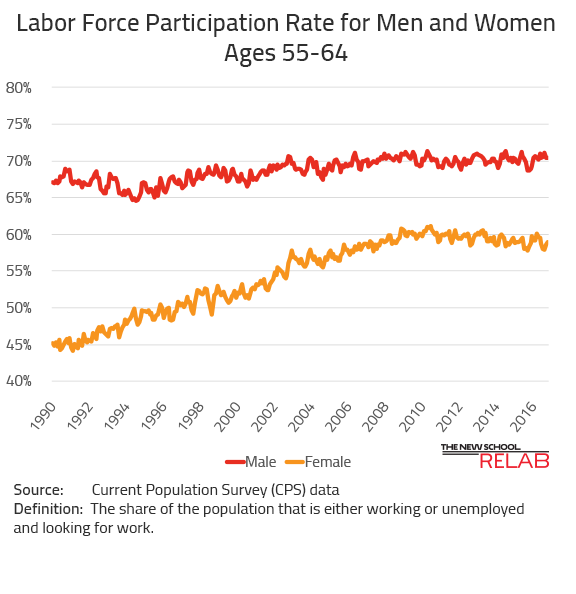 This persistent racial gap means that proposals to increase Social Security’s Early Retirement Age would require black workers to continue to do physically demanding work at older ages. 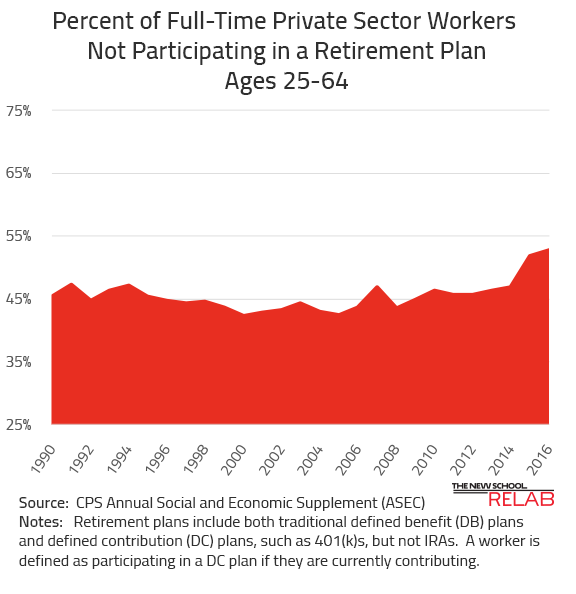 To enable all workers to retire - whether due to physical necessity or choice - policymakers should both expand Social Security and create Guaranteed Retirement Accounts (GRAs). GRAs are are individual accounts requiring contributions from both employees and employers throughout a worker’s career. They provide a safe, effective vehicle for individuals to accumulate personal retirement savings and receive lifelong income as a supplement to Social Security. 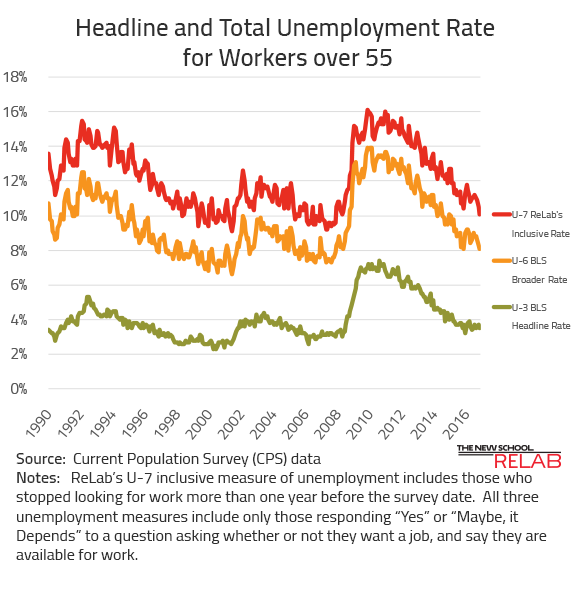 The Bureau of Labor Statistics (BLS) today reported a 3.6% unemployment rate for workers age 55 and older in December, an increase of 0.1 percentage points from November. Low headline unemployment rates imply a healthy labor market for older workers. 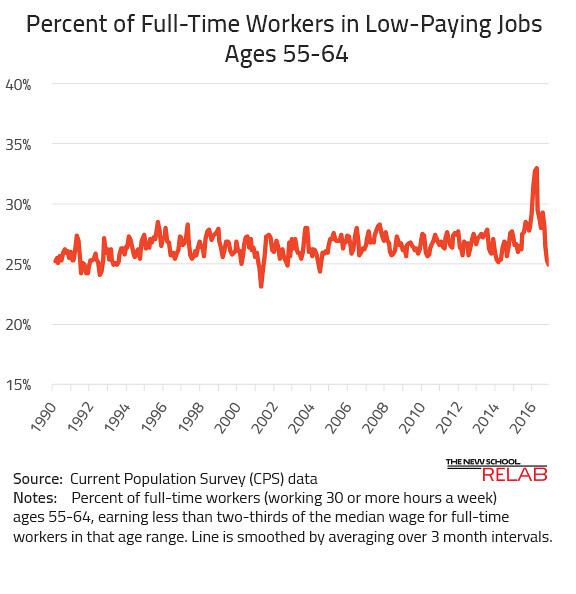 However, the official rate hides an unequal distribution of healthy jobs for older workers. 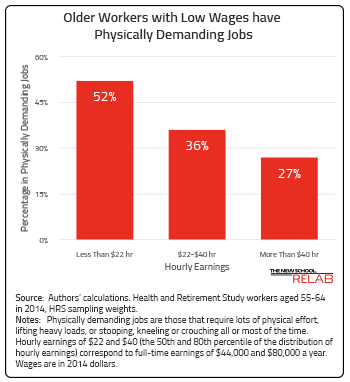 Older workers with lower earnings are twice as likely as high earners to be in physically demanding jobs. 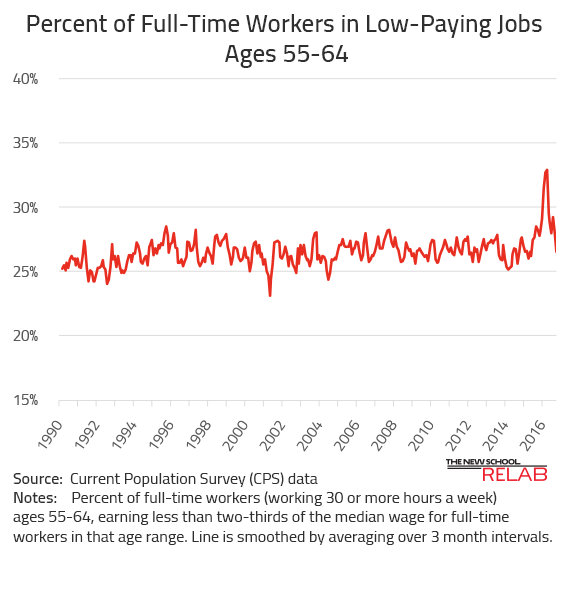 For older workers in the bottom half of hourly earnings – wages below $22 per hour – 52% report their job requires either lots of physical effort, lifting heavy loads, or stooping, kneeling, or crouching all or most of the time. 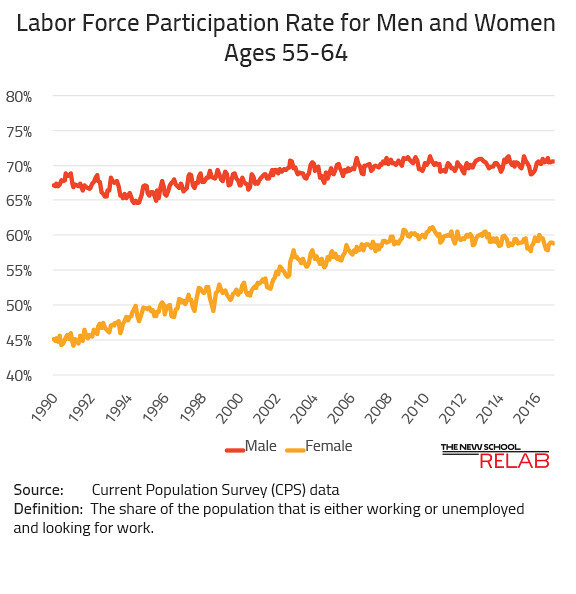 For older workers earning between $22 and $40 an hour, the number reporting physically demanding jobs drops to 36%. 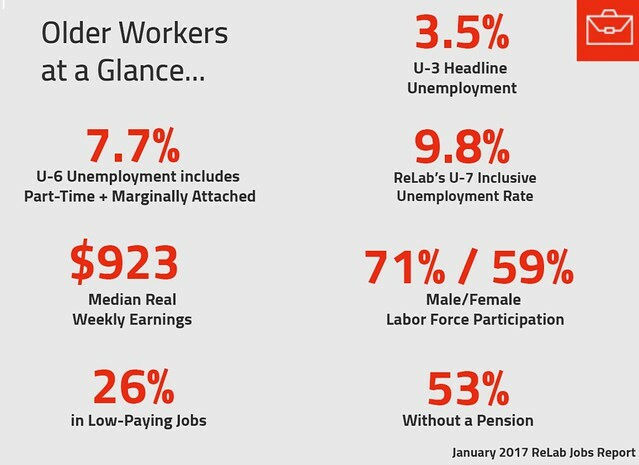 For those in the top 20%- who earn over $40 an hour- only 27% report having physically demanding jobs. Physically demanding work debilitates and breaks down human bodies. 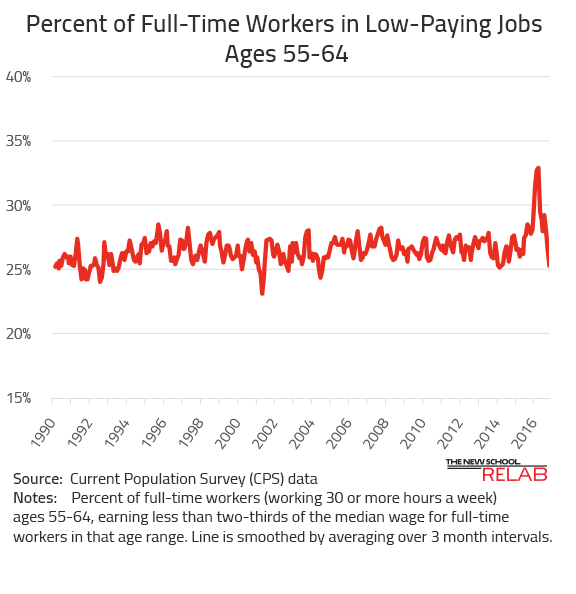 For older, low-earning workers, cutting Social Security benefits by raising the retirement age would impede their ability to leave the labor market when no longer able to handle physically demanding work. 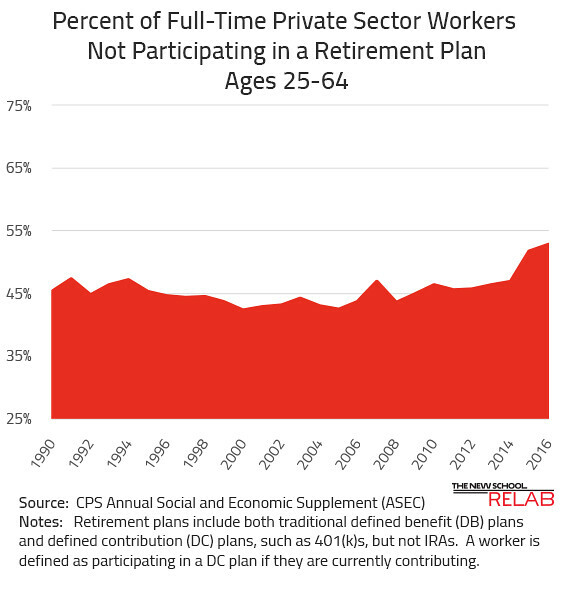 To ensure all workers can retire when they are no longer able to work, policy makers should expand Social Security and provide a universal second income tier through Guaranteed Retirement Accounts (GRAs). GRAs are a retirement savings vehicle with low fees and guaranteed growth, allowing even low-wage workers a path to secure retirement. The Bureau of Labor Statistics (BLS) today reported a 3.5% unemployment rate for workers age 55 and older in November, a decrease of 0.2 percentage points from October. 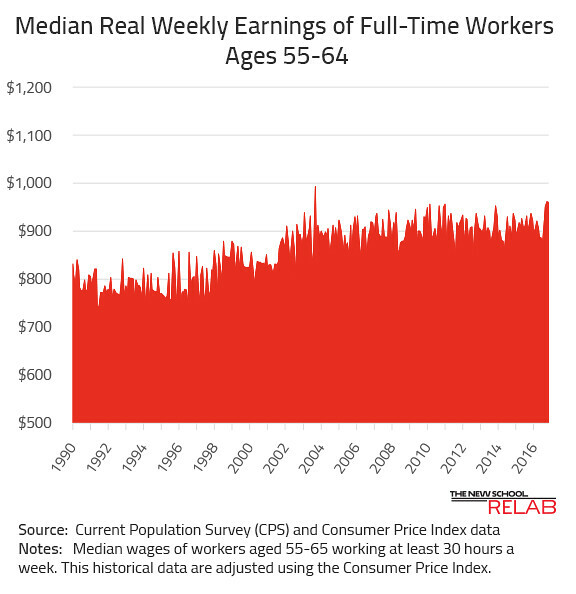 While “Older Workers at a Glance” shows steady growth in real earnings for older workers, national averages mask long-run stagnation and decline in the four rust-belt states - Michigan, Ohio, Pennsylvania, and Wisconsin - that unexpectedly voted for Donald Trump after voting for President Obama in 2012. 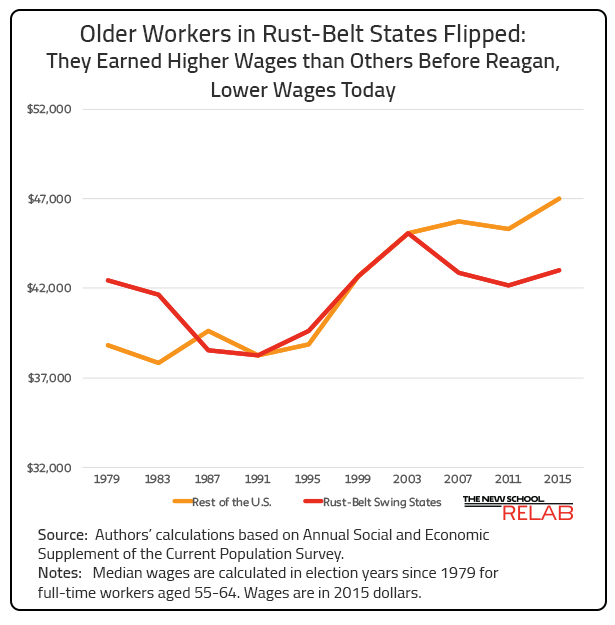 Before Reagan, older workers in these four states received higher wages than older workers in the rest of the country. Now they are doing worse. In 1979, rust-belt older workers were making $3,600 more than their counterparts elsewhere. In 2015, they were earning $4,000 less. 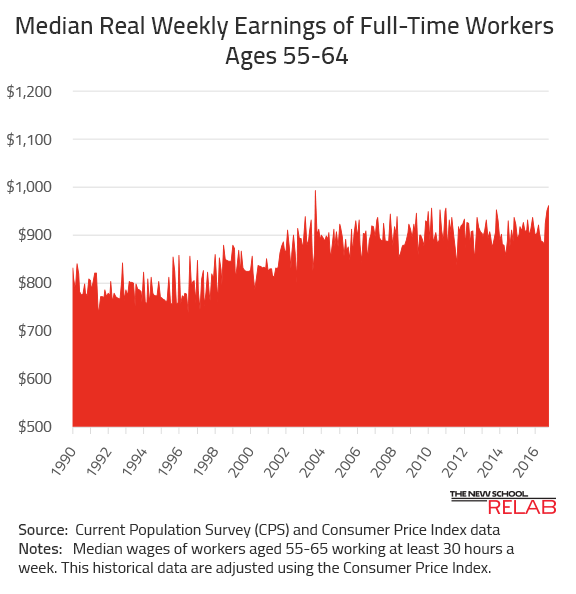 Between 1979 and 2015, the median real wage for older workers in the four rust-belt states that flipped to Trump increased only 1% compared to 17% in the rest of the U.S.
Stagnant and declining real wages erode workers’ ability to save for retirement and increase their reliance on Social Security. To address the economic insecurities of working families, the Trump administration needs to create a path to a secure retirement by expanding Social Security and providing universal access to secure retirement plans through Guaranteed Retirement Accounts. I am honored to be named as one of Next Avenue’s 2016 Influencers in Aging for my work to reform our broken retirement savings system by giving every American a Guaranteed Retirement Account. Each year, the Influencers in Aging list recognizes 50 thought-leaders at the forefront of changing how we age and how we think about aging. Influencers are leaders in improving the lives of older adults and their families and communities.